The SCHAS Daylily & Bulb Society presents this annual show and sale of bulbs and rare plants. For kids 10 and under. Egg scrambles will take place continuously and Easter baskets will be provided. Regular admission applies. Activities fee: $3 per child for members and $5 per child for non-members. Special consideration was given to plant selection and how these plants establish superior homes for native bees, birds, and butterflies. Introducing pollinators into your yard adds interest, photo ops, and learning opportunities for the whole family. Found Among the Leaves; a Bibliophytology by artist Andrew Yang is an exploration of the rich and complex relationships that entangle object with information, image with medium. The Library serves as both the project’s exhibition venue and its source material. Docent-Led Adult Walking Tours are Tuesdays–Fridays at 10:00 a.m. and Saturdays at 10:30 a.m. Tours are not offered on “free” Tuesdays (third Tuesday of the month). Please note that tours are not offered during the months of August and September. 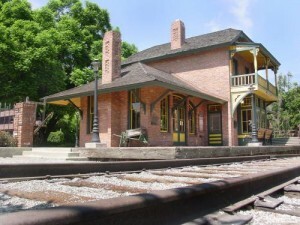 Tour the inside of this historical treasure with a knowledgeable docent and learn about what the depot was like when it was operational. Tours are on Tuesdays and Wednesdays at 10am-4pm, and Sundays 1-4pm.